I’m going to start this by telling you a bit about me: I used to be a Republican, and I’ve never belonged to any other political parties in my life. What happened after 9/11 scared me away from parties for good, and I honestly hope my example does the same for you. I grew up in a Republican household. My parents were Republicans, most of my family outside of my immediate family were Republicans, and most people I was around back when I was racing motocross were also Republicans. Because of this, I had a certain set of ideals instilled in me, such as a desire for a small, less-intrusive government that stays out of our personal lives. And, to be clear, I actually still believe this is ideal, but I just now know that sometimes the alternative is worse. I’m no longer dogmatic about it. But even as a teenager, I couldn’t quite reconcile the idea that we (Republicans) said we wanted government out of our personal lives, yet we were for the Drug War and against equal rights for gays, as two prominent examples. How about you? Join me and help me take on the parties. They don't care about you. Why would you care about them? It all came to a head for me after 9/11. I was only 24 years old at the time and had been working as a proofreader/writer/journalist at a weekly motorcycle newspaper called Cycle News. Right after 9/11, within a couple of months, I remember the Republican-majority House and Senate pushing through the USA PATRIOT Act, and then Republican president George W Bush – whom I voted for in 2000, mind you – signing it into law. Deep down, I knew it was a bad idea. I knew this was George Orwell’s “Big Brother” being moved from Fiction to Non-Fiction. But I defended it anyway. My leftist/liberal friends, chief among them my buddy Steve Bruhn (who passed away a few years ago), were all over me about it. “How can you support something like this when you believe in small government and keeping government out of our lives? !” I was doing mental gymnastics to justify it. And I was doing the same thing to justify the Iraq War, knowing full-well that Iraq had nothing to do with the 9/11 attacks. People are figuring it out. In another 10 years, maybe less, Independents like me will be the outright majority. Let's aim for "maybe less." It's time to be done with these two parties and move on. Why? There’s only one reason why: Partisanship. I was rooting for my team, rather than standing by my ideals and principles. So, in late 2002, I went through the (rather bothersome) process of excising myself from the Republican Party. After that, it still took me years of constant effort to kill off my prejudices, for example, against Democrats, and there was even a point where I swung too far the other way and ended up with a prejudice against Republicans and in favor of Democrats! But eventually I made it out of the forest of partisan biases, and I have to tell you, once you really get out of that forest, it becomes much easier to see what’s going on around you. Because the truth is that the parties rely on our partisanship almost entirely in order to continue running this country however they want to run it. This was written and posted here by Blue America, which is a progressive non-profit that supports progressive candidates. It looks like the Democrats haven't learned a lot since Hillary lost to Trump, or for that matter since they've lost over 1000 legislative and executive seats over the last 10 years. What I’ve come to realize over the last 15 years of soul-searching is that, overall, neither party really gives a crap about any of us unless they need our money or our votes. They don’t care if we live or die, much less whether we’re truly able to enjoy the “pursuit of happiness” that our forefathers promised us. They do not care. At all. The Republican Party and the Democratic Party care about one thing, and one thing only: Getting and maintaining power. That’s it. They don’t care about any of us. Once you begin to understand this, you’ll start to see that they don’t even care about their party’s pet issues. For example, the only reason that Democrats said they wanted to fix healthcare prior to their passage of the Affordable Care Act (AKA: Obamacare) is because that’s what they knew voters wanted, and that helped to put them into power. But the power was the point, not the healthcare, because the kicker to this is that they would’ve rather not fixed healthcare if at all possible. The problem with actually following through and fixing something like healthcare is that, politically, it removes one of their bargaining chips. When they fix a problem that they promised they would fix, they have to find another pet problem to fix in order to justify voting for them in the next election. And that, at its core, is why Obamacare is such a poorly written, poorly executed healthcare bill. It wasn’t just that both parties are bought and paid for by the healthcare and pharmaceutical lobbies, it’s that not enough of the Democrats truly wanted to fix the problem. I believe the same can be said in regard to both parties about abortion, gay rights, and guns. The Democrats controlled both houses of congress from 2007 until 2011 and they didn’t even attempt to pass any gun legislation (which, as a pro-gun guy, I’m thankful for). But they sure have talked about guns a lot before they took power, and after they lost it, haven’t they? And the same can be said for Republicans, who have done nothing to shore up gun rights in this country whenever they’ve been in control. The head of the NRA, Wayne LaPierre, makes about a million bucks per year to be the CEO, and there are a lot of other people employed at all levels of the NRA as well. That money comes largely from individual NRA memberships as well as money from manufacturers and other folks in the gun industry. That money is donated to the NRA in order for the NRA to fight anti-gun legislation in Washington, DC, and around the country. So, imagine that somehow, magically, all of the gun rights the NRA says we should have became permanently enshrined in law here in the USA. Imagine the NRA got its way completely and permanently. The NRA would go extinct overnight. Mr. LaPierre would lose his job along with everyone else at the NRA. That’s why the NRA doesn’t actually want to “fix” the issue of guns for its members. The NRA relies on the strength of their opposition. The worse the threat against our gun rights is (or the worse they can make it seem), the more money the NRA makes. The parties also rely on the strength of their opposition in order to gain or maintain support and power. If the Republicans and Democrats couldn’t fight over guns, or the rights of minorities (or gays, or women), or anything like that, they’d actually have to come up with real policy solutions to our actual problems here in the real world. As it is, they don’t have to do that. All they have to do is keep us fighting amongst ourselves and they can continue to reap the rewards while we suffer. 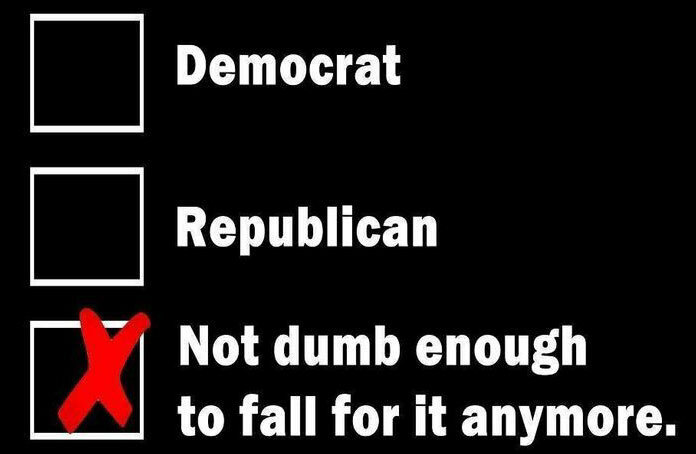 Being an independent isn’t a party affiliation; it’s a way of thinking. And I hope to help change your way of thinking during this election cycle so we can take on these partisan hacks together come 2019.